Zombies!!! 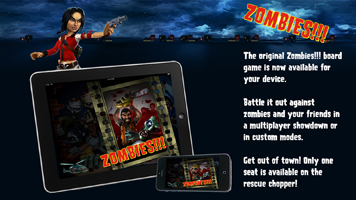 is a digital adaptation of an original board game by Twillight Creations Inc. The original board game holds the distinction of having received the Origins Awards Best Graphic Presentation of a Boardgame award in 2001. The digital version can be purchased for all of the platforms listed above for $4.99 at their respective stores. Zombies!!! is a traditional "roll and move" board game with some interesting twists. One to four players can play locally or online with any combination of human players and ai players that can be chosen from a list of 10, each with unique play styles. The default mode follows the rules of the original game where the game board is built dynamically, but the digital version also includes other play modes with pre-made city game boards. At the beginning of each player's turn he or she draws a location tile and adds it to the board. 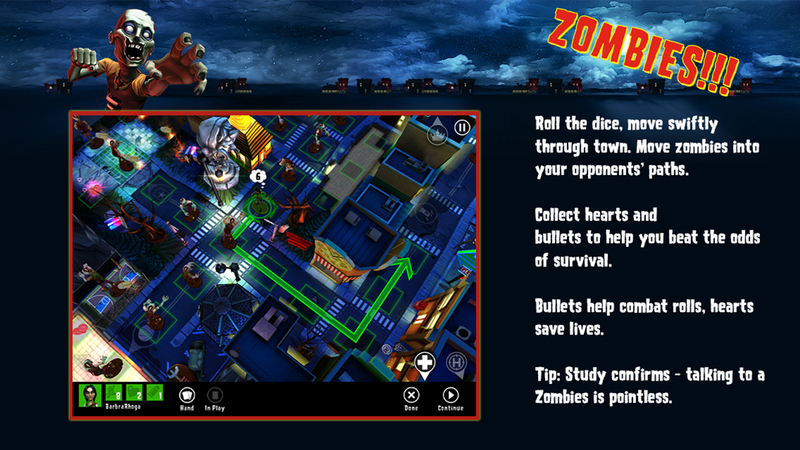 These locations are then populated with supplies and the undead. 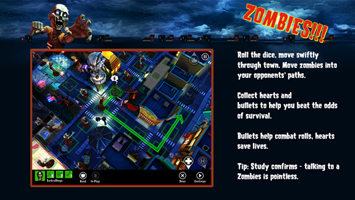 Players then traverse these locations attempting to fight off zombies using dice roll combat, and collecting supplies crucial for continued survival. Eventually the helipad tile is draw and added to the board, at which time the game becomes a race between players to be the first to battle there way there to be lifted off to safety and win the game. During game play, strategies emerge involving where you connect the location tiles you draw to the board in an attempt to create situations advantageous to you and not the other players. This is not a cooperative game, it is a cut-throat "every man for himself" battle for survival. The digital version of Zombies!!! shines with top notch graphics for the genre, mimicking the award winning graphic design of the physical version while bringing it into the 3D digital space. The tongue and cheek comical presentation avoids some of the more gruesome aspects of the zombie theme making the game "family friendly". If you are a fan of the original game, boards games, or zombies this one may be worth investigating.